Does anyone know what BFG means? I didn’t. But it is the name of a movie released Friday. I did a little bit of research and decided to check it out at the local theater Saturday night. 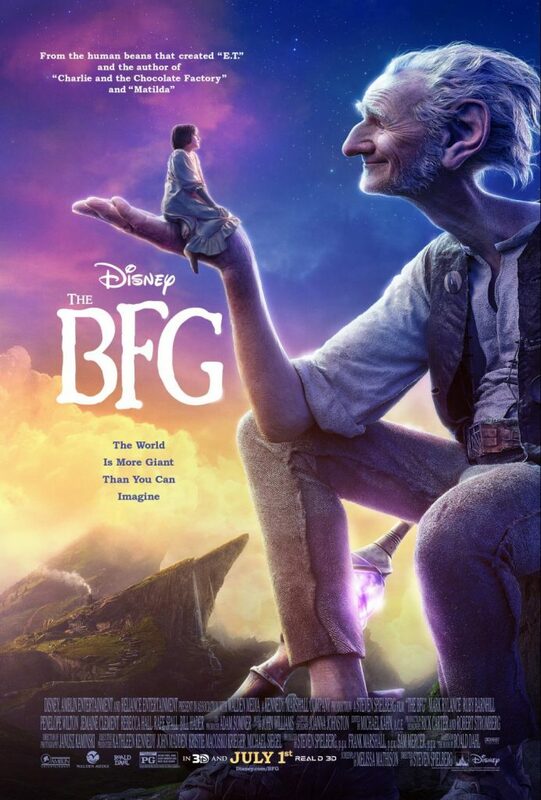 BFG stands for “Big Friendly Giant.” It’s the story of, well, a big friendly giant who abducts a 10 year old insomniac orphan girl when she spots him outside the orphanage in London and whisks her off to Giant Country. Mix in the 1982 story by Roald Dahl (Charlie and the Chocolate Factory, Matilda and James and the Magic Peach among others), stir in a screenplay by the late Melissa Mathison (E.T. the Extra-Terrestrial, The Indian in the Cupboard and others), add the directing talents of Steven Spielberg (E.T. the Extra-Terrestrial, The Adventures of Tintin: The Secret of the Unicorn and many, many more) and mold together under Walt Disney Pictures and you would think all the right fantasy ingredients were in place. It took awhile for the plot to develop as well as the relationship between BFG (Mark Rylance) and Sophie (Ruby Barnhill). The 24 foot BFG is a dream-catcher by trade and Sophie was more annoying than lovable. But it did develop as BFG tried to protect her from the other much larger giants in Giant Country, who had this penchant for eating little children. There were some early scenes that clicked and others that just didn’t make sense. But that’s okay … it is a fantasy. I wasn’t particularly impressed, but decided to take my cues from the younger audience in attendance. When BFG is first shown with his huge ears, beady eyes and a wrinkled face, the little girl in front of me turned away and tucked her head into her dad’s shoulder. Even the adventure to the root of dreams fell short as the two tried to capture the rogue, scurrying balls of light reminiscent of Tinkerbell. It didn’t seem to have a point. But the predictable walk to the spot amid the sleeping 50 foot giants did. The scene where BFG was put atop a garbage truck while Sophie — hidden in a car — was part of roller skates as a giant raced down opposite hills. That captured the attention of the young ones and quieted their restlessness. The plot continued with Sophie conjuring a plan to have BFG create a dream — actually a nightmare — for the queen (Penelope Wilton) so she could “see” giants kidnapping innocent children. The kids liked the breakfast scene with the queen, her top military advisors and, yes, her three dogs, where BFG shared some of his fizzy frobscottle, a drink where the bubbles go down instead of up and result in a particular passing of gas known as a whizzpopper. Watching the dogs fly across the room with a green flatuence trail while those in the room also share some green air somehow was funny to the younguns. Okay, some of us olduns too. The queen’s response was to order the removal of the giants from Giant Country by military force and relocate them to a remote island where they could do no more harm. In the end, we think, Sophie is adopted by the queen’s assistant with her adventure remembered as a dream. She goes to the window and says, “Good morning, BFG.” And in Giant Country, BFG’s Dumbo-sized ears perk up. I’ll be honest, it’s not a film I would particularly want to see again, but neither was Matilda. My grandkids, though, can’t get enough of her … so who am I to judge what a youngster would like. THOUGHT TO REMEMBER: What if we stepped out of bed every morning with purpose and a desire to make a difference in someone’s life besides our own. This entry was posted in Readin', Ritin' & Rithmetic and tagged BFG, children, DPchallenge, dreams, family, life, Movies, relationships, Review. Bookmark the permalink. Thanks for the review. Love the last paragraph of your post, esp the older I get. You’re welcome. Us grandpas have to stick together.